Sun and clouds mixed. High 74F. Winds NW at 10 to 15 mph.. If built, Interstate 11 would connect at Sahuarita Road, above, and then east to Interstate 10. The above view is looking west on Sahuarita Road. The I-11 route as proposed last year. A new interstate could loop around Tucson's west side if local officials can marshal community support. The southern end of the proposed Interstate 11, which would become part of the Canamex trade corridor, initially was to stop in Casa Grande. The assumption was that Pima County's 2007 resolution opposing a bypass highway to accommodate freight trucks meant excluding Pima County. That resolution stemmed from environmental concerns because the previously proposed routes ran through the Avra, San Pedro or Aravaipa valleys. But the combination of an economic crisis, Mexico's booming manufacturing industry, renewed interest in creating a regional distribution hub and an environmentally friendly route could wipe out that opposition. At least that's what county officials are hoping as they prepare to present a proposed Interstate 11 route in Southern Arizona. A draft of the proposed route was presented earlier this month to the Arizona-Mexico Commission. Its 56-mile Pima County path would loop west, behind the Tucson Mountains and the San Xavier District of the Tohono O'odham Nation, then connect to I-19 near Sahuarita. From there, it would veer east as part of the proposed Aerospace Parkway on the city's southeast side and connect to I-10 near Rita Road, where the University of Arizona Tech Park, Port of Tucson and Target Fulfillment Center are located. Southbound exports could travel I-19 to Mexico and - from the Port of Guaymas - to markets in Latin America, Europe and Asia. Northbound imports could avert city traffic and connect from I-19 to the Port of Tucson or move to markets on the East Coast via I-10. Citing "significant economic threats" from California and Texas to lure exports away from Arizona to their ports of entry, county officials told commission members the interstate could help retain our current flow of trade and encourage more. The Canamex Corridor, as defined by Congress in the 1995 National Highway Systems Designation Act, is a joint effort involving Arizona, Nevada, Idaho, Utah and Montana. It calls for the development of a continuous four-lane roadway from Mexico through the U.S. into Canada to facilitate trade among the three countries and minimize traffic and congestion. Interstates 10 and 19 are already designated segments of the Canamex Corridor. "The current corridor is as good as it's going to get without double-decking it," John Moffatt, director of strategic planning for Pima County, said of the I-10 segment that runs through the city. The federal government has spent about $500 million on the Mariposa Port of Entry in Nogales and the Hoover Bypass Bridge in Northern Arizona. "And we have nothing in between," Moffatt said. "As trade activity increases we can't drive all that traffic right through the middle of town." Pima County Administrator Chuck Huckelberry said the 2007 resolution by the Board of Supervisors opposing a bypass highway still stands, but "it stated that we continue to look for alternatives with minimal (environmental) impact." He called it critical that a southern spur be part of the master plan for the new interstate. The first draft of I-11 connects Las Vegas to Phoenix and continues south to Casa Grande, meaning distributors could find Pinal County more attractive because of the access to the corridor. "The concept of Interstate 11 should be from Canada to Guaymas and not stop north of the Gila," Huckelberry said. "We cannot be left out of this." He expects to send a formal proposal to the Pima Association of Governments this week. PAG is the federally designated Metropolitan Planning Organization for the region and tasked with developing long-range transportation plans. 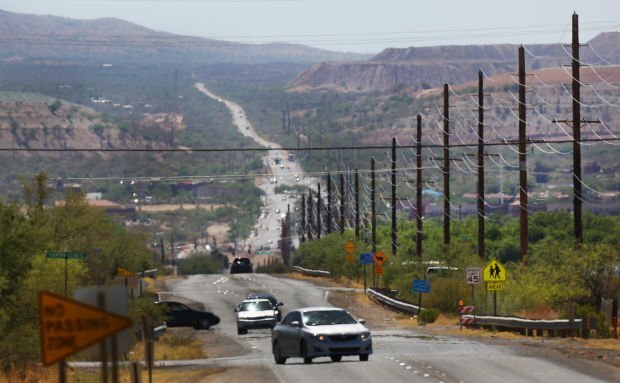 The association will host a meeting for the I-11 and Intermountain West Corridor Study in mid-July to focus on the potential Southern Arizona Connectivity Segment, it said in a written response to a Star query. 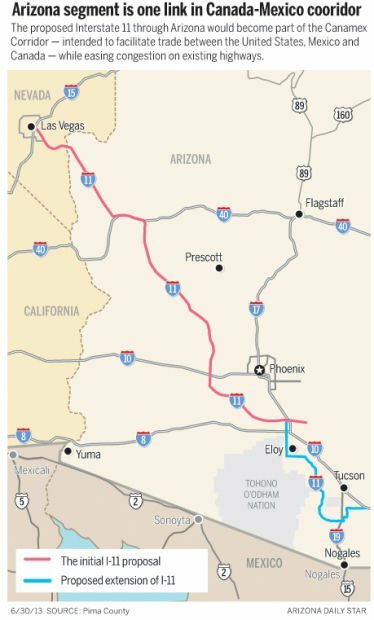 Should Pima County balk at the interstate, it could run through Yuma or Douglas to reach Mexico, the Intermountain West Corridor Study shows. The study is a joint effort between Arizona and Nevada. Visit i11study.com for more information and updates. No price or funding source has been identified for the project. The buzz around the proposed interstate comes at a time when Arizona is pushing for strengthened relations with Mexico and increased logistics activity in the region. The city of Tucson recently applied for a silence ordinance at four train crossings in the heart of the city to abate noise pollution, in anticipation of increased rail cargo rolling through town. The city's general plan has added, "Increase economic partnerships with Mexico" "Promote Tucson as an international port and regional hub for business" and "Support the expansion of passenger and freight service" to its economic development policy. Imagine Greater Tucson has identified distribution and logistics as a high-priority industry to recruit and will hold town halls in the fall to answer questions and address concerns from residents about the impact of increased trade activity. And Gov. Jan Brewer, who in recent years only mentioned Mexico in the context of border security and drug trafficking, has embraced rebuilding economic relations. Last year she established the Trade and Transportation Corridor Alliance to study trade opportunities and establishing global logistics in Arizona. The governor also reinstated a position to promote international trade - a post that had been eliminated in 2008 due to the economic downturn. In Pima County, Huckelberry would like to see the proposed parkway along Hughes Access Road become a magnet for the distribution industry. Moffatt said the regional plan will be modeled after the successful GTR Global Industrial Aerospace Park in Jackson, Miss., which invested in the infrastructure to lure the industry. Since 2003, the city, county and private sector have invested $100 million in infrastructure. In return, the region has received $3.4 billion in investments from the distribution and logistics industry, creating more than 4,000 new jobs. Contact reporter Gabriela Rico at grico@azstarnet.com or 573.4232.